The following list of activities are not technically difficult, so don’t worry if you’re a beginner. From swimming to paddle boarding, here are the top five water sports to get you in shape this summer. Compound exercises are great for burning calories. So once you hit the water with your gear, just let loose. While snorkeling, you will be diving, swimming, holding your breath and treading water. The average person can burn over 300 calories per hour just by exploring the water while snorkeling. Often considered an entry level water sport, bodyboarding at the expert level requires an extraordinary amount of athleticism. These three exercises aren’t just great, environmentally-friendly forms of transportation, they are great ways to keep fit. Whether you are paddling with a single oar or two determines the muscles you will use, but you will definitely use them. Here’s a little-known fact about paddle boarding: women tend to be better than men, especially when first starting out. 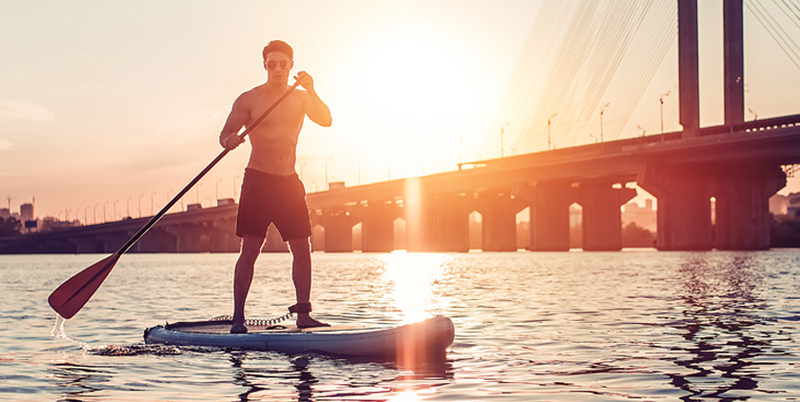 The reason is because paddle boarding requires more core strength than upper body strength. Stabilizing yourself on a board while standing so you can dig a paddle into the water takes strength, balance and flexibility. If you have ever tread water for any length of time, you immediately realize what a full body effort it is to swim. For anyone looking for a fun, low-impact way to get in shape, swimming is an awesome alternative. You can mix up strokes to work different muscles. Muscles Worked: Total Body. We can’t stress enough what a great, full-body workout swimming is. Since water sports get you out in the water and sun, dehydration can occur quickly and without much of an indication. When getting ready for an outdoor water workout, prepare by drinking at least 2 cups of water before heading out. During the workout, try to drink 6 ounces every 20 minutes to supply adequate hydration to your muscles. A general rule is to bring at least 16 ounces with you for every hour you plan to do the activity for. If you have trouble drinking enough water, take along one of the Liquid Water Enhancers! Just squeeze them into your water bottle and you have a refreshing, functional beverage you can take anywhere.